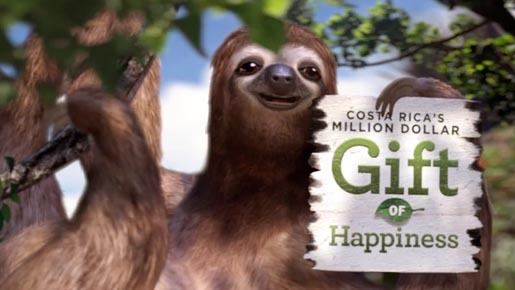 The Costa Rica Tourism Board is running “Million Dollar Gift of Happiness”, an advertising campaign featuring a talking sloth. Three commercials feature Mr Sloth, a laidback spokesanimal hanging in front of iconic Costa Rican scenes, rainforests, mountains, and stunning local architecture, and delivering happy-go-lucky words of praise for his native land in a relaxed, surfer dude-style voice. The Million Dollar Gift of Happiness campaign was developed at 22squared, Atlanta, by chief creative officer Scott Sheinberg, creative directors John Stapleton, Curt Mueller, copywriters Curt Mueller, Kevin Botfeld, Molly Crawford, art directors John Stapleton, Stephen Bridges, Dustin Tamilio, strategists Brandon Murphy, Andrew Jones, Phil Heuring, Ashley Keetle, Christina Blanchard, social strategy team David Rollo, Christopher Tuff, Natalie Espinol, producers Robert Berris, Connie Newberry, Jodi Godwin, editorial team Parker Davidson and Bryan Jameson. The TV ads were produced at Blind by creative director Tom Koh, executive producer Dave Kleinman, producers Keith Bryant, Jamey Kitchens, lead animator Michael Relth, 3D animators Wesley Kandel, Chris O’Neill, Markus Madlangbayan, Calvin Prieto, 2D animator Thomas Home, designers Wesley Kandel and Gregg Gunn, and editor Sean U’Ren.